Backfill your job board from Indeed and export jobs to Indeed via XML. Query and display sponsored results alongside your own jobs, or list Indeed jobs via shortcodes. If you have a new job board it may look pretty empty to start – solve this by backfilling job listings using the Indeed Integration plugin. All you need to get started is a Publisher ID from Indeed. Important: Please make sure to acquire the Publisher ID first before purchasing our Indeed Integration add-on. Indeed jobs are listed in a similar format to your local jobs with the exception of linking through to Indeed (with your affiliate link) instead of going to a single job description on your site. 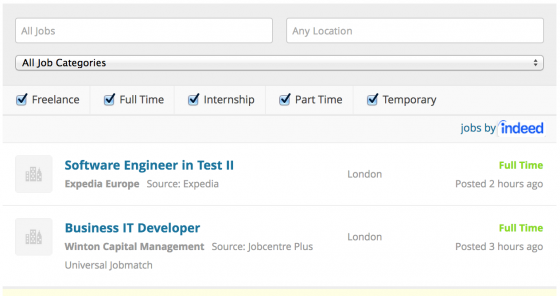 Indeed jobs can also be shown with the ‘jobs by indeed’ text (a requirement in their terms of service). 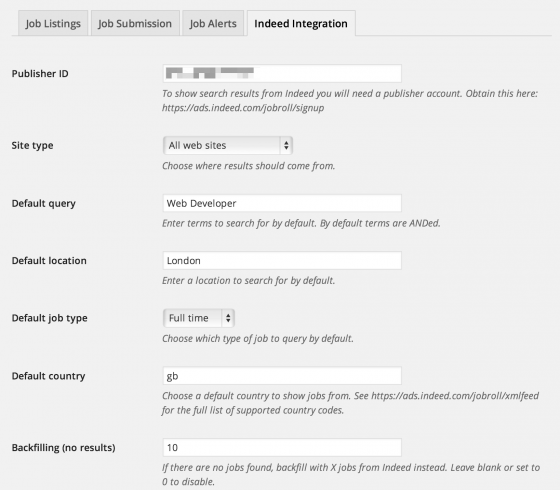 Jobs can be pulled in using default search parameters you define in the settings. Once a user does an actual search, for a location example, the Indeed queries will reflect this showing relevant results to your users. This extension also adds an [indeed_jobs] shortcode for listing solely Indeed results if you want to display them anywhere on your site. This just lists indeed jobs for the parameters you define on the shortcode (there is no searching and filtering like with the main [jobs] shortcode). On top of the backfilling, this extension also lets you Export your jobs to Indeed using an XML Feed. Simply enable the feature and submit your feed to Indeed to be included in their listings.